A couple of months ago I had the chance to sit in on a lecture by John Bogle - the founder of the Vanguard Group and, arguably, the inventor of the Index Fund. During his talk, he mentioned his concern with Exchange Traded Funds (ETFs), implying that they are far riskier than the average investor realizes. This warning is particularly poignant, coming from the man whose work led to the invention of the ETF. It is also worth discussing, as the Peak Oil Proof Portfolio is wholly comprised of ETFs. Bogle's argument against index-based ETFs, like SPY, are that they've become market behemoths - contributing to a significant portion of the investment in many companies. The problem with this is that the investments in these companies are made not on the merits of the company, but solely due to the fact that they're part of an index. For example, when an investor purchases shares of SPY, SPDR goes and purchases shares of each of the 500 component companies, in proportion to their market caps. So SPDR would put a larger percentage of your money in the largest company (company #1) than in the smallest company (company #500) - but it would still invest money in every single company, regardless of how good an investment they each are fundamentally. Because ETFs like SPY have so much market power, this "blind" investment of wealth in these companies (based solely on the fact that they are in, say, the S&P 500 index), can create a bubble enviornment where companies that are fundamentally weak continue to receive investor support simply because overall market sentiment is bullish. Bogle argued that this can exacerbate the boom and bust cycle we've recently been seeing more and more often. John Bogle's warning against ETFs seems to hold true for investing in foreign markets - the return on investment for mutual funds seems to be higher because of the freedom of the mutual fund manager to invest in higher-quality companies without having to maintain parity with an index. The disadvantages of mutual funds, however, are numerous. As you can see above, there aren't any mutual funds which are solely invested in Australia or coal or agriculture. For commodities, there aren't any mutual fund equivalents of GLD or SLV. If you invest in a gold-focused mutual fund, they will invest in mining companies rather than holding the physical metal. ETFs tend to have lower fees and have a lower barrier to investment. If, for example, you wanted to invest in the Nordic countries, you could buy as little as 1 share of GXF for around $20 today. The Nordic mutual fund (FNORX), on the other hand, requires an initial investment of $2,500 with additional investments in $500 increments. ETFs also beat mutual funds on liquidity. ETFs trade like stocks as long as the markets are open, while mutual funds are only priced once a day and traded when the market is closed. As I discuss in my "Profit from Peak Oil's Bumpy Plateau" post, this extra liquidity could be crucial if an oil price spike occurs and you need to quickly get all of your investments out of the market. 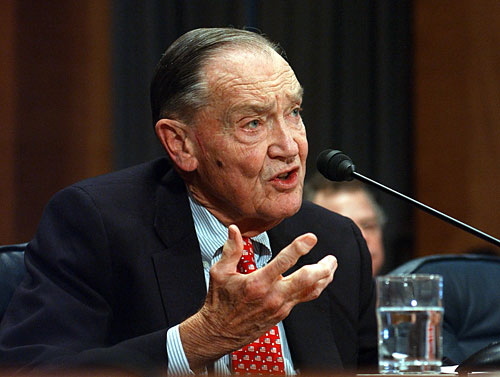 John Bogle's other main argument against ETFs is that they've turned index funds from long-term investment vehicles into short-term trading vehicles. We see this today as ETFs have become some of the most widely-used investment vehicles for algorithmic trading computers. Theoretically, this can make ETFs more susceptible to "flash crash" events, and Bogle argued that mutual funds better protect the long-term investor from such events. However, if you look at the Vanguard 500 mutual fund (VFINX) versus the SPDR S&P 500 ETF (SPY) for the week around the May 6th 2009 flash crash, you will see that they hardly diverged at all. Bogle's critics would argue that rather than making the markets more unstable, ETFs actually add to market stability by greatly increasing trading liquidity. The other main argument, not made by John Bogle, but nonetheless prevalent in discussions of commodity ETFs, is that if you want to invest in commodities, like gold, you're better off holding the metal in physical bars or coins, rather than in an ETF. These critics say that all you're buying is a "piece of paper" and not an actual physical asset. Stories about the risks of gold investment are everywhere. Bullion companies like the "International Gold Bullion Exchange" sold gold they never owned. Other bullion companies such as "Goldline International" have come under investigation for potentially misleading sales tactics. Mining companies like "Bre-X Minerals" misled investors by overestimating their gold resources. Electronic gold companies like "E-Gold" have failed to reimburse customers after their accounts were hacked. But while there are certainly bad apples out in the marketplace, I find the "only buying a piece of paper" argument to be specious. When you purchase shares in GLD, SPDR goes out on to the world gold market and purchases physical metal which it then stores at HSBC's vault in London. GLD hires the firm "Inspectorate" to regularly audit their gold holdings. The firm performs an annual complete physical audit as well as random testing throughout the year. Inspectorate claims to be the "world leader in commodity inspection and testing". Of course, cynics would argue that before the Enron's collapse, Arthur Andersen was the "world leader" in corporate auditing. So while investing in an ETF is not completely risk-free, choosing between physical gold and a gold ETF is like choosing between the risk of burglary and the risk of fraud. The risk of fraud is arguably lower, as you can always sue the company which defrauded you. In the case of GLD, you'd be able to sue SPDR and possibly HSBC. SPDR owns dozens of other funds and HSBC is one of the largest banks in the world. In the case of fraud, you'd likely have a better chance of getting your money back than in the case of a burglar breaking into your house and stealing your gold coins. The upside of ETFs over holding physical metals is enormous. Buying physical commodities, transporting them, holding them in a secure location and then selling them again is enormously expensive and time-consuming. The low fees, high liquidity and (arguably) lower risk of commodity ETFs clearly win. So what is an investor to do? The answer is "it depends" - it depends on the risk tolerance and trading preference of the investor. If you plan to buy and hold company stock for the long term, mutual funds may be the best "set it and forget it" plan. If you believe that the sky is going to fall, or the government is going to seize your gold investments, or that the next market crash will trigger "bank holidays" where trading will be halted - you may very well be better off holding physical metals. If, however, you plan on actively trading your portfolio to take advantage of changes in the market, ETFs are the best way to invest.